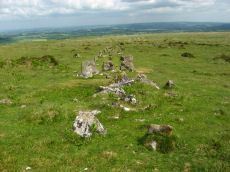 Notes: "A triple stone row lies near the summit of Cosdon Hill and is 447 feet in length measured from the centre of the circled cairn which stands at the west end. At 225 feet from the west end there is a slight change in direction and the rows turn somewhat northward. This change of direction may be said to divide the row into western and an eastern section. Overall width, western part is 8 feet 10 inches, eastern part 10 feet 8 inches. The cairn is 26 feet in diameter and contains the remains of two cists; the retaining circle is very irregular. There is no formal feature to mark the termination of the rows at their eastern end"
Notes: Turner E15 - Cheriton Combe. Dixon #95. Butler Cosdon Hill Stone Row - Vol. 2. Map 40.6 (diagram p.205). Grinsell SOUTH TAWTON 5. 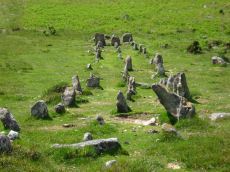 "The cairn associated with the Cosdon Hill triple stone row is 26 feet in diameter and contains the remains of two cists; the retaining circle is very irregular. Of the two cists, one is intact, the other has been robbed of the cover-stone and two side-stones." Lethbridge diagram p.152, cists pictured. Notes: Turner E1 (diagram p.59). Butler Cosdon Beacon 5 Vol. 2. Map 40.7.5. (diagram of Cosdon Summit cairns on p.207). Grinsell SOUTH TAWTON 1 (Cawsand Hill). Cairn 13.5m diameter with signs of retaining circle. Crowned by modern stone heap. HER MDV6894. See also: NMR 444167. Lethbridge diagram p.152, photo bottom right p.153. Notes: Butler Cosdon Beacon 1 Vol. 2. Map 40.7.1. (diagram of Cosdon Summit cairns on p.207). Grinsell SOUTH TAWTON 3 (Cawsand Beacon). Cairn 27m diameter, height 1.8m, crowned by modern stone heap and OS trig pillar. Large hollows in the top, from robbing, would have protected beacon fires. Notes: Butler Cosdon Beacon 4 Vol. 2. Map 40.7.4 (diagram of Cosdon Summit cairns on p.207). Grinsell SOUTH TAWTON 1b (Cawsand Hill). The cist was originally noted by Falcon as being approximately 3 1/2ft to 4ft long and 2ft wide, aligned apparently NE-SW. The SW and NE sides were fairly recognizable. Lethbridge diagram p.152, photo bottom left p.153. Notes: Turner B14 - Embanked Stone Circles (with outer bank)(diagram p.59). Butler Cosdon Beacon 3 Vol. 2. Map 40.7.3 (diagram Vol. 5. p.164). Grinsell SOUTH TAWTON 2 (Cawsand Hill). NMR Cairn B. Possible cist? Notes: Turner A6 (diagram p.59). NMR Cairn A. Butler Cosdon Beacon 2 Vol. 2. Map 40.7.2. (diagram of Cosdon Summit cairns on p.207). Grinsell SOUTH TAWTON 4 (E of Cawsand Beacon). Located 25m to east of Cosdon Beacon. A near circular bank 1.6m wide of double slab construction and about 21m across. HER MDV27452? 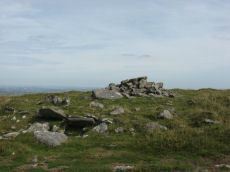 Notes: Cairn at the junction of two Bronze Age reaves. 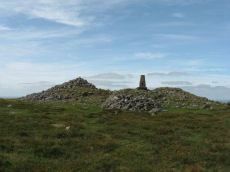 "Round cairn on Cosdon Hill, measuring 7.3 metres in diameter and standing up to 0.8 metres high. A number of edge set stones visible around the southern side of the cairn mound suggests the existence of a kerb. There is a hollow in the north side of the mound, probably the result of partial robbing or an early excavation."